Click on a beach pin to learn more. Artists, palm readers, street performers, bodybuilders and more can all be found at one of the most iconic beaches in the world. Great spot for scuba diving, fishing, surfing and swimming. Over a mile of beach and 15 acres of bluff for great viewing. Picnic tables and restrooms are available. Dockweiler has it all. Fire rings, bike path, RV Park with full hook-ups, Youth Center, 3.7 miles of beach and 288 acres. 94 acres of beautiful beach with volleyball nets, showers and a playground as well as restaurants and great night life. Quiet and less crowded than most LA area beaches. Excellent spot for fishing and scuba diving. Parking and restrooms are available. Surfrider Beach comprises Malibu Lagoon and Malibu Pier. With 22 acres of wetlands, a mile of beach and fishing from the pier there is something for everyone. Manhattan Beach has over 2 miles of ocean frontage and 115 acres of beautiful sandy beach and a 900 foot pier. Parking is available with over 450 public parking spaces. Nicholas Canyon is a great beach for surfing, body surfing, body boarding, swimming, windsailing, and scuba diving. Restrooms, picnic tables and parking are available. Zuma Beach has 1.8 miles of beach frontage with 105 acres of property. There are approximately 2,000 parking spaces. Food stands are located at each end of the beach. Restrooms, restaurants, showers, and volleyball nets. Over one mile of ocean frontage with 34 acres of sand. 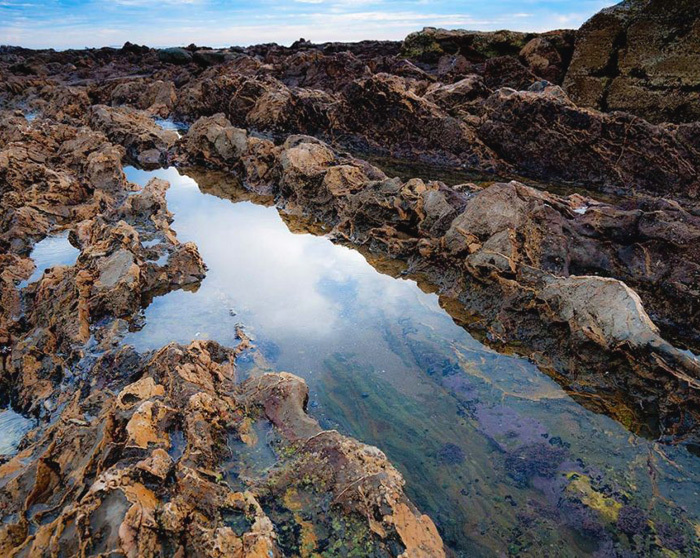 It is surrounded by headlands, cliffs, rocky coves, and vast beach access. Restrooms, restaurants and showers are available. With over a mile of ocean frontage and 21.5 acres of property Topanga Beach is the first real beach in Malibu. Visit this beach to swim, scuba dive and fish. Restrooms, picnic tables and showers are available. It’s nice and sandy, is perfect for sunbathing and swimming, and has over 3 miles of beach frontage and about 103 acres of beach. Redondo Beach is over a mile and a half long and it runs south from the Redondo Beach Pier to Torrance Beach. There is a parking structure for the pier along with street parking. Amenities include showers, restrooms, and volleyball nets. Torrance Beach lies between Redondo Beach and Malaga Cove. 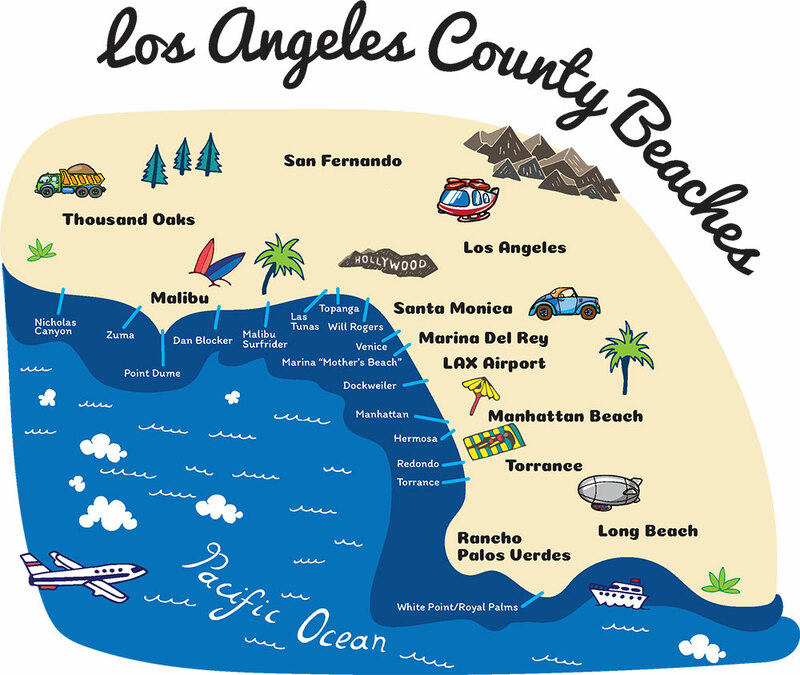 The region shared by Torrance and Redondo Beaches is often called “Rat Beach” (short for “Right After Torrance” Beach). This beach, with its colorful history, is a great place for a family outing. The bluff portion of this beach has metered parking, ample restrooms, children’s play area, picnic tables, and outstanding panoramic views that include Catalina Island. 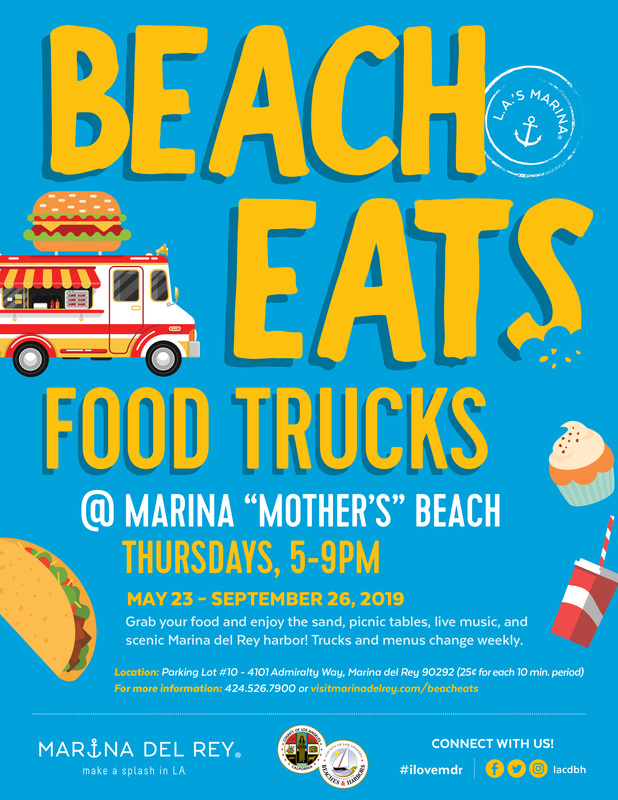 “Mother’s Beach” as it is referred to by local residents, is a family and kid-friendly, man-made beach in Marina del Rey. The area is comprised of almost a half-mile of sandy beach with volleyball courts, picnic areas, barbecues, showers, and restrooms. Learn more about shopping in Marina del Rey. 13851 Fiji Way. 310-482-6000. 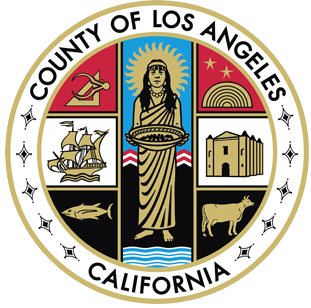 Visit Sheriff website. 4433 Admiralty Way. 310-823-3773.Visit Fire Station website. 4350 Admiralty Way. Learn more about Yvonne B. Burke Park. 4135 Admiralty Way. 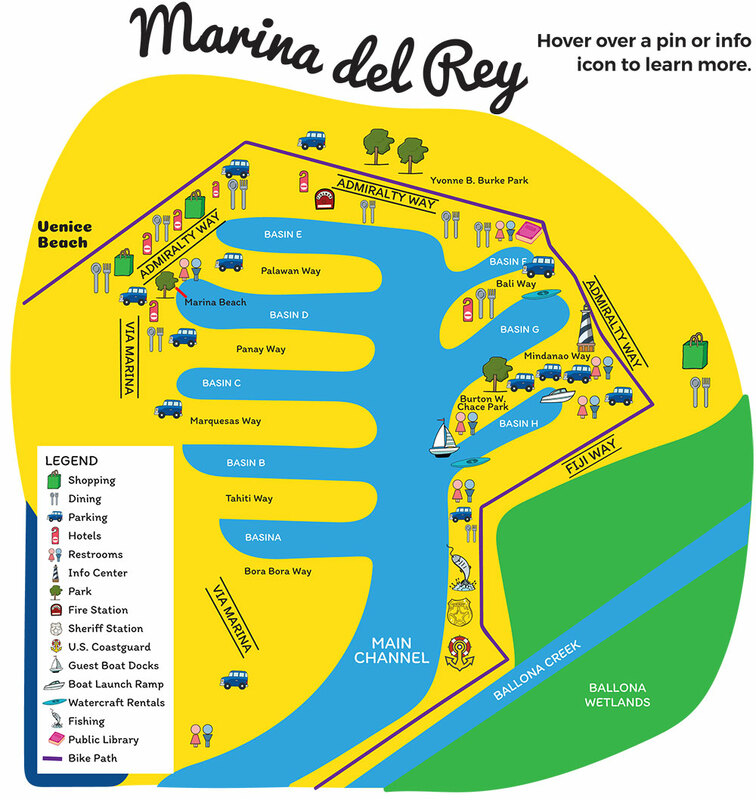 Learn more about Marina "Mother's" Beach. 13650 Mindanao Way. Learn more about Burton W. Chace Park. 13477 Fiji Way (Basin H). Learn more about the Boat Launch Ramp. 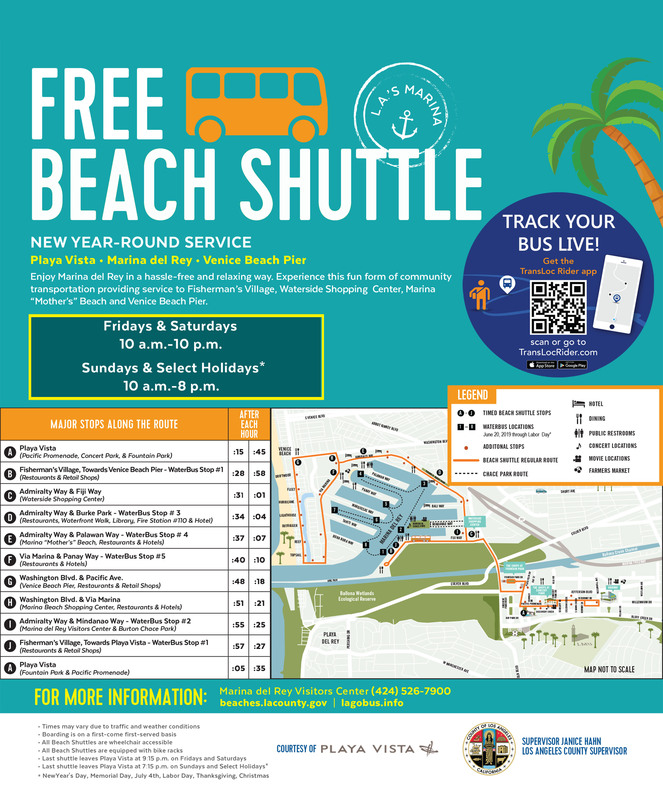 Licensed fishing is permitted at the north and south jetties as well as Venice Pier, which doesn't require a license. Learn more about Fishing. With waterfront views, year-round outdoor dining and award-winning restaurants, Marina del Rey is a burgeoning culinary scene right in the center of the Los Angeles coastline. Find a restaurant. Only 4 miles from LAX, our hotels are easily accessible, making it an easy choice for business and leisure travelers. Find a hotel. 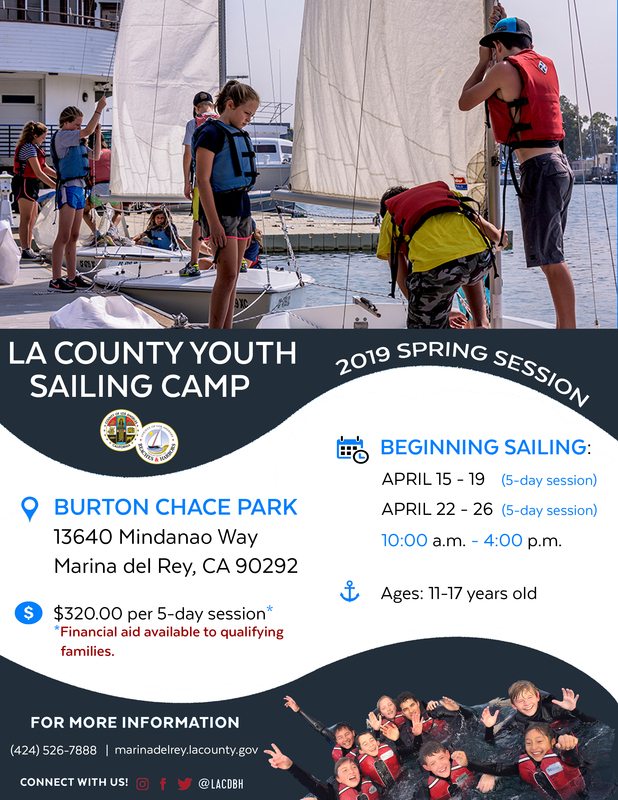 Guest docks are only a short distance from the boat launch ramp and trailerable boat storage areas at Burton Chace Park and are available on first-come first served basis. Learn more about Guest Boat Docks. 4533 Admiralty Way. 310-821-3415. Visit the library website. Learn more about Marina biking.